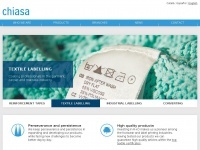 Chiasa is leader in textile industry and expert of coating process, manufacture reinforcing tapes for footwear and label material for diferent sectors. The web server used by Chiasa.es is run by Altecom and is located in Barcelona, Spain. On this web server 37 other websites are hosted. The language of those websites is mostly spanish. The websites of Chiasa.es are served by a Apache web server using the operating system Debian (Linux). The software used to serve the webpages was created by using the programming language PHP. For managing the data of the webpages the CMS WordPress in the version 4.7.4 is used. XHTML 1.0 Transitional is used as markup language on the webpages. The website prohibits search engines and webcrawlers using the description of the website from the Open Directory project. Other actions by webcrawlers and bots are allowed.